Friday was the last day of swim lessons for the tribe. 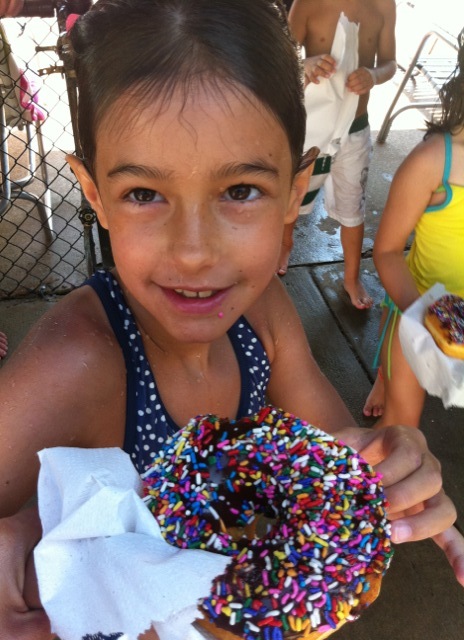 As such, there were donuts waiting for the kids after class and a chance for everyone to jump off of the diving boards. For those who have not passed the vaunted “swim test” — 25 meter swim followed by 60 seconds of treading water — this marked their first foray into the deep end of the pool and onto the diving boards. This donut is bigger than my face and I’ll eat it all. Yesterday, Josephine passed the test and promptly went to the deep end. 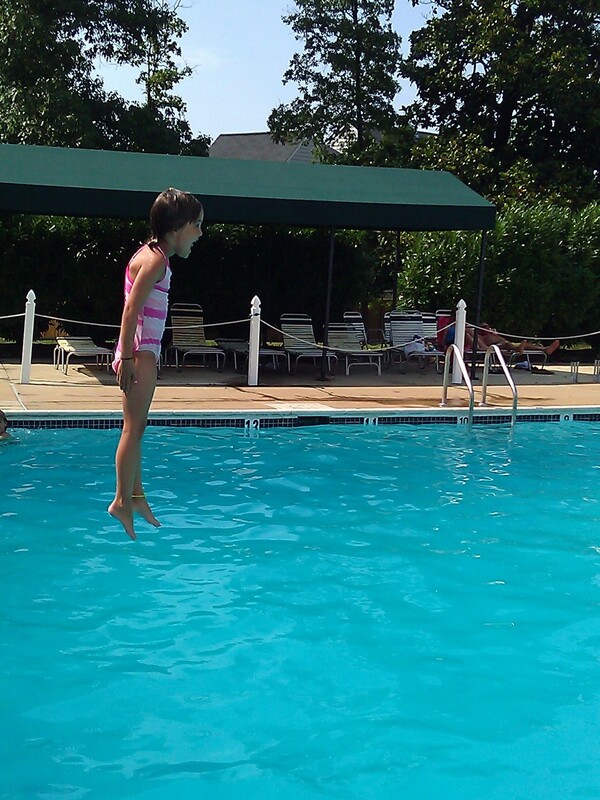 She played with her sister and experimented with every manner of feet-first jumps including a nearly perfected cannonball. Today was Desmond’s turn. There was a little more concern that he’d pass the test on the first try. He came through with flying colors and we promptly tried some tandem jumps. 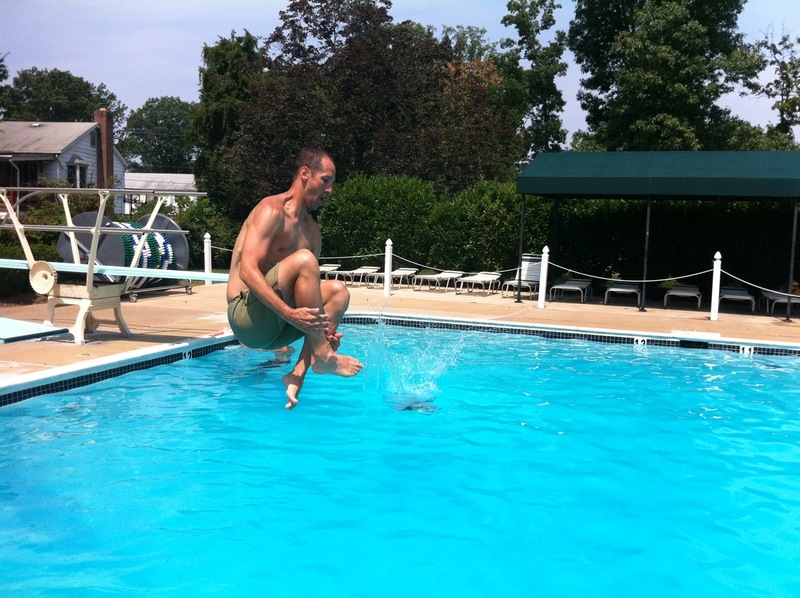 Desmond leads the way in a tandem jump by twisting his way into the pool. The highly coveted bracelet signifying access to the deep end of the pool. I had my own milestone, of sorts. This morning I ran. For the first time in two weeks, I ran. It was only 2.4 miles, on a pancake flat road, and was the sum of my exercise for the day. Regardless, I ran without my leg giving out. Two weeks ago, a pair of tendons in my left shin blew up on a run. Strained, stretched — whatever, it was pained and painful. I saw the hopes of finishing well, even finishing, Ironman Lake Placid slip away. Slowly, those hopes are coming back into focus. It won’t be the race that I was imagining just a few weeks ago, but it can still happen. There are only 13 days left until the race. I have an ice pack on my leg now and have been steadily gobbling ibuprofen. Rest, ice, compression, elevation — these have been my watchwords. From this point forward, they are also the means to the next big milestone. I won’t be adding any fitness in these two weeks — only losing it and hopefully consolidating the gains that were made throughout the spring. Love cannon ball biceps and blog featuring my god babies, des and Josie. Best of luck to you my friend.